We’re bringing a recipe with which to wow your guests. A gourmet dish which screams luxury and decadence, easy to prepare and which does not require take ages to prepare. It has it all. It is nutritious, healthy and simple. A real wow dish for the palate. We suggest some scallops in saffron sauce. Are you ready to don on an apron and cook the dish with us? Let’s start off by preparing the saffron sauce. To that end, chop the onion and garlic and sauté in a frying pan with butter and a dash of EVOO. When it has browned, add the saffron strands. When the garlic and onion are stained with the incomparable colour of saffron, add white wine and allow the alcohol evaporate. When it has evaporated, add the cream and cook over low heat for about 7 minutes. Set aside. Sear the scallops in another frying pan with the remaining butter and when seared, add to the frying pan containing the sauce. Season and garnish with fresh parsley. Et voilà. Scallops in saffron sauce are an appetiser or a perfect first course dish perfect for those days when you wish to be decadent and give yourself a little treat without leaving home. Should you decide that it is a first course or even a main meal, you can prepare a side dish of Basmati rice. You can similarly make this recipe using frozen scallops and the result is also delicious. As you can see, the scallops in saffron sauce recipe is not particularly complicated. Furthermore, if you don’t like scallops, you can use the sauce with any other fish or vegetable and the result is finger licking good. Of course, bake some tasty bread as you’ll won’t be able to stop dipping the bread into the sauce. 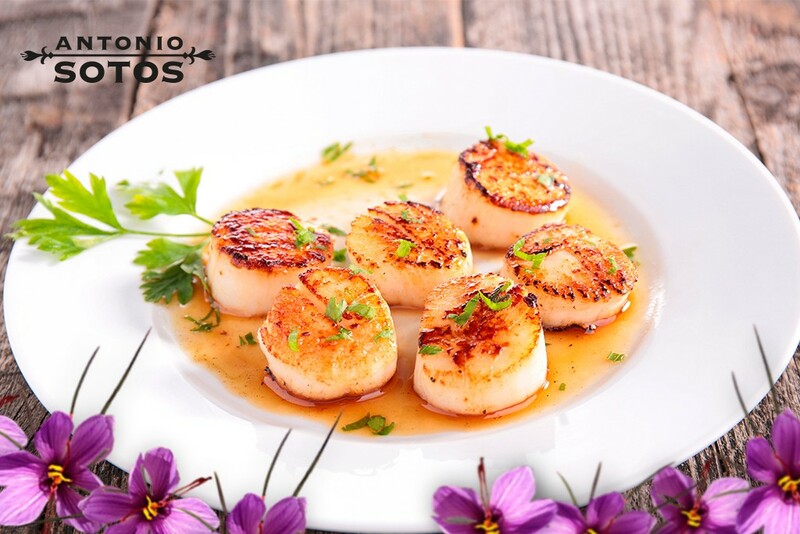 Cooking tip: Be careful with the desired point of doneness (cooked to perfection) and do not overcook as so that the scallops do not become rubbery.